Hug a Teddy Bear and a Book! Cuddly, snuggly, soft and friendly–teddy bears can be a child’s best friend and are often featured in children’s books. Stuffed toy bears became popularly know as “teddy bears” after an incident more than 100 years ago when President Theodore Roosevelt was on a bear hunt. When the president showed compassion for an old bear found by his hunting dog, a cartoonist documented the event for newspapers. Soon toy bears named “Teddy,” after the president, were being made and sold. Find out more on the kids’ page of http://www.theodoreroosevelt.org. Bears have been characters in children’s literature for just as long. Winnie the Pooh, Paddington and Corduroy are all beloved bears with unique personalities that have entertained generations of children. Here are some favorite bear books that are each part of a series. When you find one book your family likes, you can read more about the same character. If you have a teddy bear at home, maybe he’d like to listen too! “Bear at Home” by Stella Blackstone, illustrated by Debbie Harter. Bear opens his house to readers and shows us each room, ending in his bedroom where he says good night. Illustrations are bold and use bright colors. There is a floor plan of the house in the back of book. The books in this series are just right for very young children and come in board book format. “Ten Little Bears: A Counting Rhyme” by Kathleen Hague, illustrated by Michael Hague. This duo has created many bear books, all with rhyming text and illustrated in very detailed watercolor. In this one there is a count down of bears from ten to none then back to ten bears again. Lots of action and “I spy” opportunities make this book engaging. 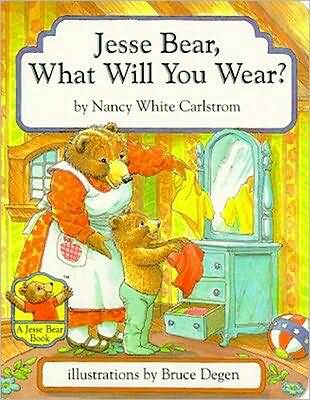 “Jesse Bear, What Will You Wear?” by Nancy White Carlstrom, illustrated by Bruce Degen. This bouncy, rhyming book is a tender and sweet story about a young child’s world. The playful, silly details show up in all of the many books about Jesse Bear. “Little Bear’s New Friend” by Else Holmelund Minarik, illustrated by Heather Green. Little Bear goes camping and meets a “wild bear” who walks on all fours and has lost his parent. Little bear enlists all his friends, and finally they find the wild bear’s family. Many Little Bear books are “first readers” with large print and few words. The original books in this series were illustrated and the character developed by Maurice Sendak. “Bear Wants More” by Karma Wilson, illustrated by Jane Chapman. This book is a sequel to “Bear Snores On,” about Bear hibernating. When Bear wakes up in the next book, he is hungry after his long winter’s nap! The author/illustrator team has created three more books about this lovable bear and his woodland friends.